A couple days ago, after several teasers on Facebook, Greubel Forsey, the recently crowned chronometric champions, unveiled the GMT. Naturally it is a tourbillon, featuring the 25° inclined Tourbillon 24 Secondes cage. The design is attractive, I like it, and in keeping with the steampunk-ish aesthetic of the brand. And I have no doubt the finishing is beyond reproach, as with other GF watches. 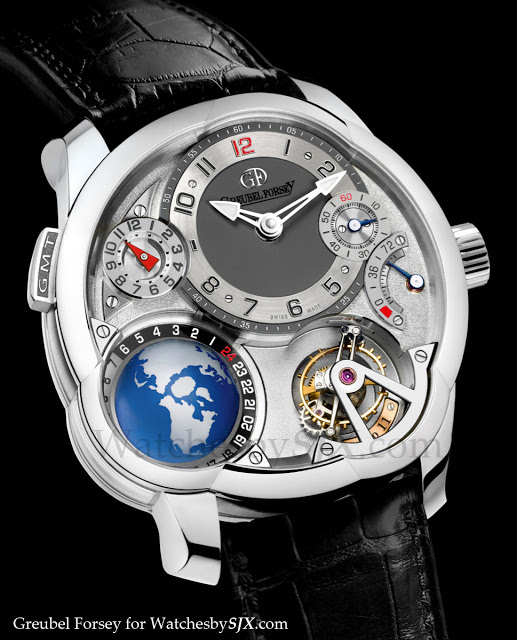 But I find the complication – a dual time zone with cities disc and a rotating earth globe – somewhat disappointing. Being used to exotic and sometimes incomprehensible tourbillon watches, a tourbillon with second time zone is somewhat of a let down. Admittedly it is impossible to continually top the previous year’s complications, but I’m sure GF has something better in store for SIHH 2012.